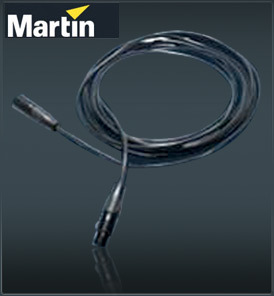 All Martin link cables are 24 AWG shielded twisted pair Martin cables. The 24 AWG can be used for runs up to 300 meters. For longer runs, or when more than 32 fixtures are connected to the link, the Martin optosplitter is recommended. Link termination is achieved by inserting a 120 ohm resistor across the signal + (hot) and signal - (cold) wires; it is important for trouble-free communication. If a splitter is used, terminate each branch of the link. The easiest way to terminate the link is to insert a male termination plug into the data output Martin cables of the last fixture. A termination plug is simply an XLR connector with a 120 ohm resistor soldered across pins 2 and 3. # 91613018 Termination plug, 3P female, 120 Ohm.